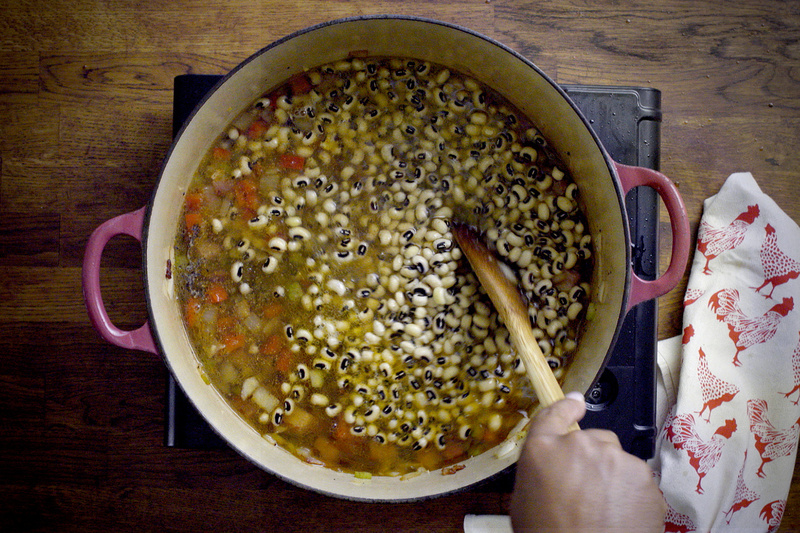 Blackeye peas are the most beloved of the field peas – a soul food seasoned with the history of the American South. Eat them on New Year’s Day and you should have good luck, good fortune and fresh hope for a new start all year long. When Union General William Tecumseh Sherman and his army cut a swath through the Confederate South, they left untouched large fields of blackeye peas that grew rampant and spread. Northerners thought these humble beans were suitable only for livestock, while white Southerners considered them a rough meal for field workers, as the beans were first introduced to the region by enslaved West Africans. 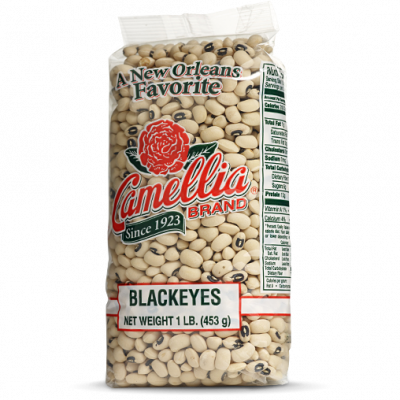 They were both wrong: when the Civil War finally ground to an end, these delicious, previously disregarded beans literally saved the lives of desperate, starving Southern families. 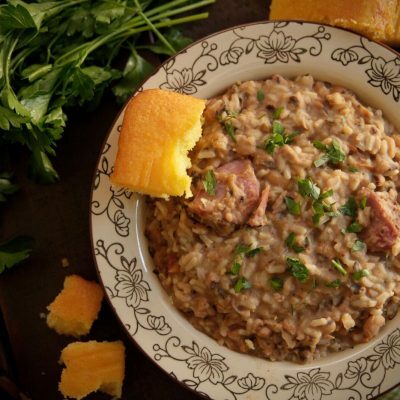 To this day they signify a fresh start, and they’re an important part of the Southern culinary canon, most notably as a traditional New Year’s Day meal to set the stage for a year of prosperity. In the American South the traditional New Year’s meal also includes collard, turnip, or mustard greens; the greens are thought to symbolize money. 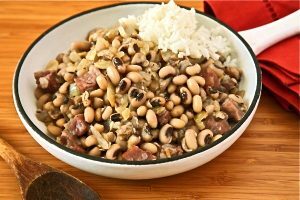 Both the blackeye peas and the greens are flavored with ham – some say because pigs forage in a forward motion, representing a push forward to new prosperity. 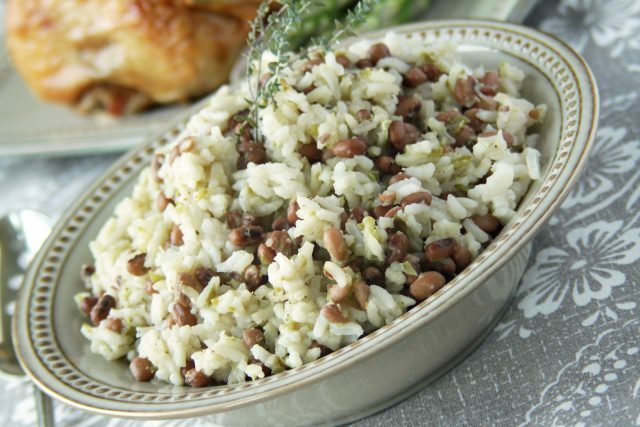 Most Southerners eat their blackeye peas either as a sort of stew ladled over rice, or in Hoppin’ John, a similar dish with the rice cooked in. Sort beans, removing debris and broken pieces; place in a large bowl. Rinse beans under running cold water until water runs clean. Cover beans with one inch of cold water; let stand at least 8 hours or until needed (do not soak longer than 24 hours). Completely drain beans before cooking. Heat oil in a large pot over medium-high heat. Add pickled pork; sauté 5 minutes or until browned. Add onions, bell pepper, celery, garlic and tomato paste; sauté 15 minutes. Add water and bay leaves; bring to a boil. Add soaked beans; stir well. Return to a low boil; cover with lid, reduce heat to low and simmer 1½ to 2 hours or until the peas are tender, stirring occasionally. If a creamier texture is desired, use the back of a spoon to mash up to one-fourth of the tender beans and stir well. Taste; adjust seasoning with salt, pepper and/or hot sauce. Serve hot over hot cooked rice with hot buttered French bread. Garnish generously with green onions. Makes 8 servings. Sort blackeye peas, removing debris and broken pieces; place in a large bowl. Rinse under running cold water until water runs clean. Cover beans with one inch of cold water; let stand at least 8 hours or until needed (do not soak longer than 24 hours). Completely drain beans before cooking. Heat oil in a large pot over medium-high heat. Add onions; sauté 5 minutes. Add tomato and garlic; sauté an additional 5 minutes. Add water, ham hock, bay leaves and oregano; bring to a boil. Add soaked beans; stir well. Return to a low boil; cover with lid, reduce heat to low and simmer 1½ to 2 hours or until the peas are tender, stirring occasionally. 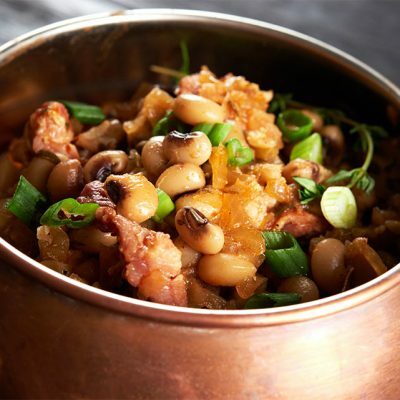 Remove ham hocks, pick meat from bones, chop and return to blackeye peas; discard bones, skin and other unwanted items. Remove bay leaves and discard. Add rice, cover and simmer an additional 25 minutes or until the rice is tender. Add green onions; stir well. Taste; adjust seasoning with salt, pepper and/or hot sauce. Makes 6 servings.